Developed by Nobel Prize-winning illumination scientist Shuji Nakamura, SLD Laser's LaserLight headlight system aims to redefine automotive lighting. 10 times brighter than current LED lights, the system can light objects up to a kilometer (.62 miles) away, yet thanks to the beam's pinpoint nature, can be directed down and to the sides to avoid the eyes of oncoming drivers. In a more futuristic application, it can also transmit data to the driver-assistance systems of other cars using a standard known as Li-Fi. SLD's LaserLight system will be available in Europe this year as OEM equipment on models including the BMW M and 5 Series, but due to regulations, no US launch date has been set. The removal of the home button and flat-sided design of the new iPad Pros make them look less like an iOS device and more like a MacBook screen that's been separated from its keyboard. Brydge's latest offering makes them whole again. Available for both the 11- and 12.9-inch models, they offer full backlit keyboards with dedicated iOS keys, aluminum bodies, and robust, multi-angle hinges. Face the iPad forward and use it as a touchscreen laptop, face it outward and use the keyboard as a stand, or fold it over for tablet use with the keyboard resting behind the screen. They come in space gray or silver and include a protective rear cover. Three years in the making, the Fender Acoustasonic Telecaster Guitar blends elements of acoustic and electric guitars like no instrument before it. Inside the hollow, Telecaster-inspired body sits the Acoustic Engine, an electronic box developed with the acoustic pickup gurus at Fishman. It provides access to a curated selection of voices, allowing the guitar to mimic the sounds of different woods and bodies — including electrics — at the flick of a switch. It also has a new Noiseless pickup, a mahogany neck for added warmth, and the patent-pending Stringed Instrument Resonance System, which gives it a naturally loud, dynamic sound. Some golf courses are known for their beauty, others their history. Some are lucky enough to have both. But if it's truly worth mentioning, you'll find it in Golf: The Impossible Collection. Compiled by award-winning golf journalist George Peper, this astounding compendium covers the 100 most notable courses around the world. From the hallowed fairways of St. Andrews to greens and clubhouses built within the last few years, it gives intimate details of each and every spot alongside stunning photography and quotes. While the book itself is meant for casual reading, expect a serious urge to start booking tee times when you pick it up. Arrives in a hard shell display case. Based in Brooklyn, New York, graphic designer Scott Reinhard combines vintage maps with elevation data to create stunning pieces of art. Reinhard uses a chromogenic process to create each print, which takes traditional color photography development and integrates 3-dimensional data with paper maps for a result that is so visually appealing, you'll be tempted to reach out and feel what looks like 3D texture. The process brings the maps to life, creating a 2D print that is vibrant and detailed giving you a unique work of art that blends history and modern technology. In addition to the topographic maps, Reinhard creates compelling digitally rendered maps and has even adopted his technique to the surface of the moon. Choose from map prints of Death Valley, Rocky Mountain National Park, Glacier National Park, Joshua Tree, Marfa, Texas, Hudson, New York, or a digital rendering of all the buildings in New York City. There's a reason people are still converting Apple Extended Keyboards to USB. There's something about the feel and sound of mechanical keyboards that membrane-based models just can't match. The Keychron K1 Mechanical Keyboard uses Fraly low profile blue switches to provide a vintage typing experience in a more modern package. Available in black or space gray, in 87 or 104 key versions, and for Mac or Windows, it measures just 18mm high, with an aircraft-grade aluminum body, LED lighting, and Bluetooth wireless with USB Type-C charging. Combining handsome looks with effortless portability, the Nomad Charging Stand is an ideal wireless charger for the frequent traveler. The aluminum kickstand slides through the charger to prop things up, then stows away around back for easy travel or lay-flat use. Its Horween leather-wrapped charging surface also helps keep your device scratch-free and adds an extra touch of class not seen in more common plastic models. It's been optimized for iPhone X, iPhone 8 and 8 Plus, iPhone XR, iPhone XS, and iPhone XS Plus with a 7.5W output, enabling faster charging than its 5W competition. Foams and creams are great if you're going for a the clean shaven look, but your more modern face trim might require Baxter of California's Beard Line-Up Shave Gel. The clear, non-foaming gel allows you to see exactly where you're cutting, making your shaving routine a little less taxing. Perhaps more impressive is that this gel can be used with or without water, making it ideal to store in a travel Dopp kit when you might need to shave in a pinch. Aloe Vera, eucalyptus oil, and Vitamins C & E ensure your mug remains hydrated and irritation-free during your shave as well as after it's done. Cooling mint refreshes once you've finished that work-of-art-of-a-beard on your face. Originally created as book covers, these archival-quality art prints add a fresh, colorful layer to the iconic Ian Fleming's James Bond legacy. Each limited-edition print features a different Bond girl from the respective title, and are printed on thick, 100% cotton rag paper that's signed and numbered by the artist Michael Gillette. The hand-torn border adds a distinct look to each, and they can be float mounted or matted. Each is officially licensed by Ian Fleming Publications Ltd. We've chosen to offer our favorite Bond titles, including Casino Royale (the first book in the series), Dr. No (the first Bond film), Goldfinger, Quantum of Solace, For Your Eyes Only, and Moonraker. Available in both large and small formats. Other than Gillette himself, Uncrate is the only authorized retailer of these James Bond prints. Whether it's clipped to your keychain or the outside of your bag, the Nomad Lightning Carabiner ensures you're never without a charging cable. It hides an Apple MFI-approved Lightning plug in the bottom and a full-size USB plug in the top, letting you get a quick juice up from any available port. A stainless steel alloy frame and DuPont carbon composite casing provide longevity and toughness, and while it's by nature not very long, that's also not the point — the point is to make sure you can charge your iPhone (or iPad) when you need to most. The way your iPhone case looks is almost as important as the protection it provides. This case from Nomad checks both boxes. It has a protective microfiber lining and a body that is made from high-grade polycarbonate and secured to a raised bumper on the edge. This helps it defend your screen against clumsy drops from as high as 10 feet. It's also wrapped in Horween leather for a soft feel and standout look that develops a unique patina over time. Compatible with wireless chargers, and available in black or brown. Note: Works with both iPhone X and iPhone XS. The camera cutout is slightly off-center on the iPhone X, though it has no effect on functionality. Get on the Black List. Be the first to know about the newest gear, automobiles, and apparel for men. YOU’RE NOW ON THE LIST. 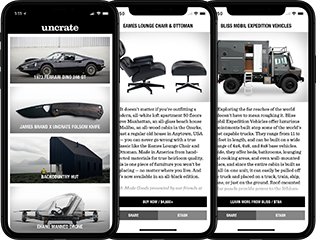 © 2019 Uncrate LLC. All rights reserved. Free shipping over $25 in the U.S.